While shopping in a small business or a local store, it is better to use debit cards as there is very high likelihood of you being charged a transaction fee. Also if you are following a strict spending plan, debit card is always the right choice as it automatically limits your spending. Credit cards often lead you to fulfilling your instant gratification because of credit limit availability and thus lead to over spending. 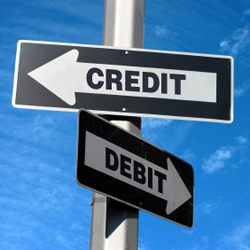 Depending on the circumstances, credit can be a much more powerful and flexible option than debit. You're protected from identity theft, your purchases can be protected from defects and failures, and disputes are handled quickly without you having to pay up just to get your money back. However, credit cards are still credit, and you're in debt for the purchases you make. You pay interest on them, and not being able to handle your credit wisely can lead to serious financial problems. Sometimes it can be better to not spend at all unless you have the money to spend—in which case debit card and cash are better options.